When you get a craving for this classic American comfort food, make this skillet version for an easy weeknight dinner. Everything is cooked and can even be served in a skillet! I used my Homemade Cream of Mushroom Soup from my last post to make this even tastier. It's perfect when you are cooking for two! 8 oz. 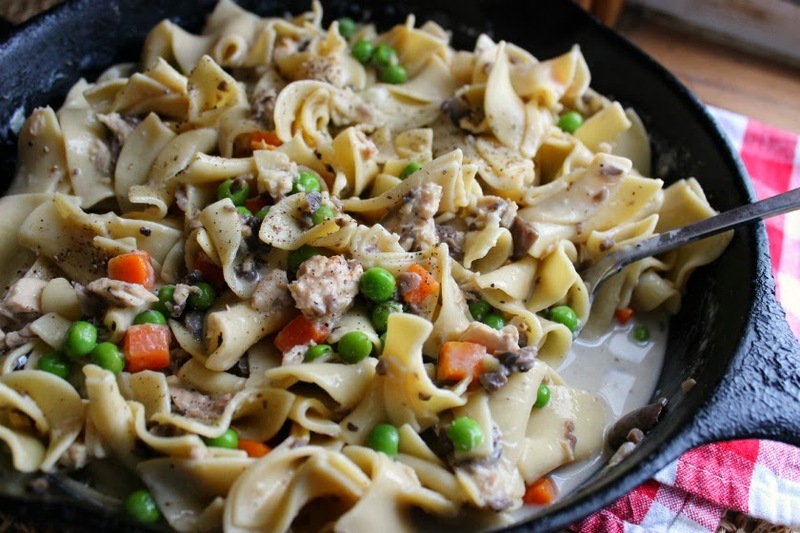 Pennsylvania Dutch Hearty Homestyle Egg Noodles 3 cups water 1 cup frozen mixed vegetables 1 can condensed Cream of Mushroom or Cheddar Cheese Soup 1 (6-ounce) can tuna, drained and flaked 1/2 cup milk Salt and Pepper to taste In a medium skillet, bring water to a boil. Add noodles and reduce heat to a simmer. Add vegetables, cook 5 minutes longer. Stir in soup, tuna, milk and pepper. Heat through Let stand several minutes to thicken before serving. Sounds like one of those comforting dishes from childhood... Love it! Happy Valentine's Day!